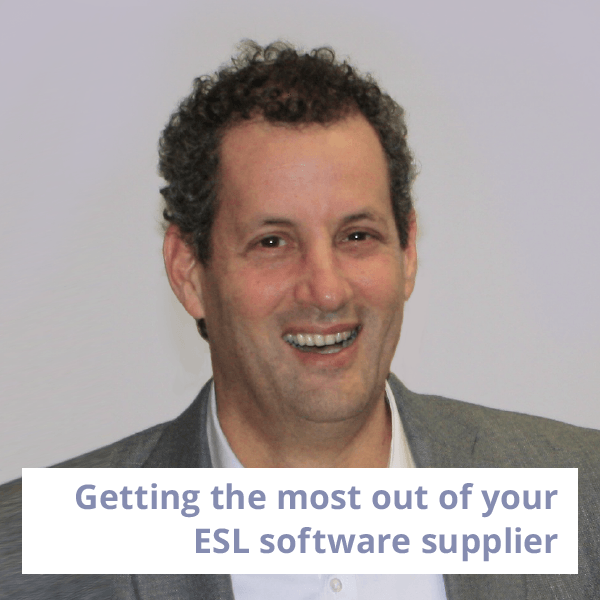 What level of service should you demand from your ESL software supplier? Andrew Stokes (AS) talks to Samuel Sheinberg (SS), who draws on 20 years of experience with NAS Software to offer some tips. Samuel Sheinberg is the Marketing Manager of NAS Software Inc.
NAS is one of the largest ESL software distributors in North America, partnering with schools, colleges, universities, public libraries and government ministries. The company offers a variety of programs for the classroom and independent learning. NAS Software has been working with ClarityEnglish for over 20 years. AS: Let’s begin with some background. Why did you join NAS Software? SS: I just rolled into it. I was very interested in the technology. I worked with another company in the field of educational software and then joined NAS. I narrowed my interests down to language programs with a lot of focus on the ESL market, and I work mainly with schools, colleges, universities and public libraries. AS: When a school is choosing which software to buy, how can they take advantage of a supplier’s knowledge of the market? SS: In my experience, the teachers know what their students need. We can help by giving them information about what other schools with the same needs are using. We can tell them which programs are available, and which ones are successful. There is no straight answer to the question ‘What should we buy?’ You need to go through a whole interview process: What are the learning needs? What is the age group? What kind of computers are you using? This also helps the supplier get to know you, the teacher, and this can be really useful once the school has bought the software. Let me give you an example. A school bought a software program, but the teacher who was supposed to use it was really not comfortable with technology. I was able to show her how some of the exercises could be printed and used in class on paper. This was the start of a journey for the teacher, and she went on to become much more enthusiastic about using technology with her students. AS: How can schools get the best possible deal from their supplier? Should they be asking for discounts? SS: Since we are dealing with the education market, discounts are already typically included in the price. We do have a promotion every once in a while, and it’s very important to ask if there are any promotions. And you should remember to ask whether there are any extras. For example, as part of our support we offer materials such as posters to help teachers promote the programs to their students. AS: OK, so let’s assume that an institution has made a purchase. What should they expect from their supplier? SS: I guess the first and most important thing is the follow-up. The supplier needs to make sure that everything is OK, that they are using the material, that they understand all the features that are available within the program. And the supplier should be there to support them if they need any help. Support is absolutely key. One of our customers, a public library, needed online support from Clarity because they had an unusual issue with the configuration on their computers. The problem was that the library closed at 4pm, and the 12-hour time difference with Clarity’s office in Hong Kong meant that there was no overlap in the working day. I was so pleased that our team at NAS was able to arrange for Clarity’s technician to get up at three o’clock in the morning to run that technical support. That is the kind of service we like to provide. At the end of the day, that’s what’s really important about our relationship — if you think there is something you would like, let us know. This can sometimes lead to quite major developments. I had a lot of teachers asking me to provide materials for newcomers to Canada that would help them with their English, and at the same time help them learn about the country. There was nothing available, so we developed a whole program called My Canada which helps them learn about geography, history, government and, of course, has a focus on English. It’s now used right across the country. AS: As a supplier, you’ve made it clear that you want to help the customers. What can customers do to make this work better? SS: One of the issues we have is that computers can be locked and they have different kinds of protection. We are very happy to provide technical support, but customers need to make sure that we have access to the computers — especially if we are visiting you on site or someone is getting up at three o’clock in the morning. One more thing. When you are buying, it helps to be completely open with your supplier. Let them know what you are expecting, and what kind of budget you have. I know I can provide the best possible service when I know what my customers are expecting, and the budget they are working with. A good supplier will be able to build a nice package that fits in with any budget. AS: Are there any warning signs that tell a school that it might be time to change their supplier? SS: I think the most important thing is if they sold you materials and there wasn’t a follow-up. Then, if you’ve got any technical issues and you’re not getting a reply right away, that’s another sign that something is wrong. And of course if they are trying to sell you something that you don’t need because that’s the only material that they have, that’s number three. AS: NAS Software has been selling software for more than 20 years. That’s a long time in this industry. What has made your company so successful? SS: I think two things. Firstly, it’s so important to make sure that the customers are getting the most out of the software they have bought. That’s why we continue to support them, no matter how long ago they purchased it. We won’t nickle and dime the customer like some companies who stop their support after a year. The number two is having the right material, and that means knowing the needs of the different groups in the market, and making sure you have the right software for what they need. And of course to enjoy what you are doing — and I love talking to my customers. You can visit NAS Software’s website here.